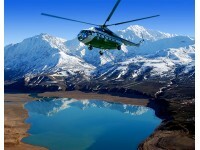 We invite you to participate in helicopter tours to Tien Shan Mountains. You will be able to see unapproachable and beautiful mountain landscapes from a bird's-eye view, will be able to visit the realm of alpine meadows and crystal clear lakes. You will have an opportunity to fly over snow and mountain ranges, canyons, waterfalls, mountain rivers like Chatkal, Koksu, Pskem, stroll along stroll along the legendary Pulatkhan plateau and stop to have a picnic on the shore of the picturesque Urungach lake, which is called “jade” for its unique color of crystal clear water. Here you are going to have a picnic, walks, boating and swimming in the refreshing water of the lake. Helicopter tours are a wonderful and unusual way of original and unforgettable celebration of birthdays and anniversaries, also, it would be the great present for friends and business partners, to motivate employees as an incentive, post wedding “honey” walks and active corporate team buildings. Tour company “AsiaAdventures” invites you to exciting and unforgettable tour on MI-8-MTV in the mountains of the Western Tien Shan which will be held on 29.07.2018. You will see unapproachable and beautiful mountain landscapes from a bird's-eye view. Helicopter in Tashkent, helicopter tours in Tashkent, helicopter tours in Uzbekistan, order helicopter in Uzbekistan. The flight will pass over the mountains and passes: we fly over the canyon of the Koksu River, we look at the waterfalls and lakes from above, land on the ridge of the Big Chimgan and stop for a picnic on the high-mountain lake Ikhnach. You will see unapproachable and beautiful mountain landscapes from a bird's-eye view, enter the realm of virgin alpine meadows and crystal lakes, fly over snow peaks and mountain ranges, canyons, waterfalls, mountain rivers and stop for a picnic on the shores of the picturesque high mountain lake Urungach, which is called "nephrit" for its unique color of crystal clear waters. Helicopter walks are a wonderful and unusual type of holding an original and unforgettable celebration of birthdays and anniversaries, a gift for friends and business partners, incentive groups, post-wedding "honey" walks and active corporate team buildings.